Ice cream as per your choice of flavour. I have used La Cremeria "Vanilla Cashew Delight". Wash and cut all fruits into small and tiny pieces(If you dont like it with skin you can remove it and then cut). Water melon into small cubes. Put in a bowl and add little sugar. Keep it in fridge for 1-2 hours. Then later can be served with ice cream or as it is. Fruit Salad is ready to eat. Variations: Cut all fruits into small cubes and add salt and pepper. Can also mix custard powder. I am reposting this recipe, since my friend in orkut Kris told me more information and correct method in Andhra style. Then later I checked with my neighbour Bharathi Aunty who is from Hyderabad and got the recipe for Alam Chutney. 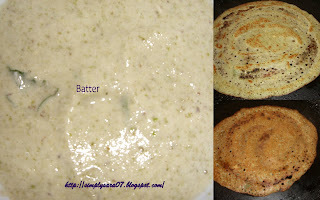 Pesarattu is a dosa (Crepes) made with green gram dal. This is a dish of Andhra style. A very tasty and healthy dosa. Soak green gram and rice for 1 to 2 hours. Grind in mixie with the skin to fine paste. In a pan heat oil and asafotida. Then put in batter and mix. Heat a skillet(Dosa kal/tawa) pour the batter like dosa and spread thinly. Put 1 tspn oil and cook both sides till crisp and brown. Pesarattu is ready to serve. This can be served with Ginger chutney which is called Alam chutney in Telugu. This is also served with a topping of Upma just before you remove it from pan or with Upma and its called MLA Pesarattu. This is tasty and more filling. Grind all the above things raw in mixie to a fine paste. Fresh Ginger Chutney(Alam Chutney) is ready. - While making for kids you can grind ginger and green chilli with green gram and ricein the batter.- The batter cant be used more than a single day even you store in fridge over night. Always batter needs to used fully on the 1st day itself since the 2nd day it does not taste good at all. - Chutney - If you dont like the raw taste of ginger you can slightly fry all ingredients in a pan and then grind to fine paste. - While making with onion put chopped onion on the tawa and then pour batter and spread. By this onion is nicely mixed with batter. Tips: While making dosa, heat a pan and while pouring batter keep it in low flame and then increase flame and cook. when removing reduce to low flame. So it is easy to spread the batter and not stick to pan. In a vessel, make a paste of cooked toor dal and water. Add manjal, mash pieces of ginger, slit green chilli into the center and salt. Allow it to boil well. Heat little oil in sauce pan. Add mustard wait till it splutters and add jeeragam. When you are ready for lunch squeeze lemon and mix well. Do not heat after adding lemon juice. Taste and check it should be a good ginger flavour too otherwise add some more ginger and boil well. Lemon Rasam is ready to serve. Notes - If you are making more quantity add lemon juice only when you are serving lunch or dinner. Also do not add when hot. Its been a week since my last post, my target is 2 posts a day. But with my son keeping me busy trying to keep it to 1 post a day. This is in my drafts since a month so posting it today. Paneer - Indian Cottage cheese is favourite for most of them. I know its more of fat but..... I dont miss to order any paneer dish in restuarants as its my favourite too:-)This is used mostly in Northern India. Now a days most of the kids love too. Heres you go with how you make paneer at home. When its finally forming cream put vinegar and allow it to boil for 1min. So that full milk to curdled. off the stove. Now in a muslin cloth pour and filter it slowly. Be careful its too hot. Then remove full water and keep a heavy vessel or any weight on it to remove excess water for about 3-4 hours. Then remove and store it in freezer. Later you can cut in cubes or grate it whenever needed. See step by step procedure. Then add vinegar to curdle the milk. Stir well so all milk is curdled. Keep a heavy weight on it so no water is left out. Now after setting for about 4 hours it looks like this. You can cut paneer and store in freezer or directly start cooking by frying it in ghee or oil. Paneer is ready to use. This can be used for Bengali sweets or gravy. Notes: You can use little lemon juice too for curdling but vinegar is better. Sometimes paneer is of lemon flavour. Paithangai Mezhaku Varati in Malayalam. This is very tasty curry prepared with coconut oil. This is famous in Kerala. Wash and cut Paithangai into 1inch long pieces. Heat a kadai, put coconut oil, mustard and wait till it splutters, now add urad dal and wait till it turns brown. Add dry red chilli and fry for a minute. Add chopped Paithangai and little water. It will take long time to cook. Keep an eye on water add if required until it cooks well. Keep in medium flame. Sprinkle salt and close a lid. Stir occasionally. Once the vegetable is cooked with no water left. Notes : If you are not used to cook with coconut oil. Can cook in normal cooking oil and just add a drop of coconut oil at the end for flavour. Later was browsing through Nags blog found in that she is hosting Monthly Mingle Ravishing Rice Recipes with Meeta MM. So posting it today since 15th is last day for entry. Cook rice and keep separately. Allow it to cool a bit. By mixing hot rice makes sticky sometimes. In a thick bottom kadai, put oil, l/2 tspn ghee, spices, jeeragam and fry for 2 mins. Now add rice, sprinkle salt and mix well. Break cashews to small pieces and fry in ghee in a sauce pan. Garnish it to the Jeera Rice. Jeera Rice is ready to serve. Enjoy this yummy rice with Dal Fry. Click here for my Dal Fry recipe. Dal Fry is a tasty gravy. 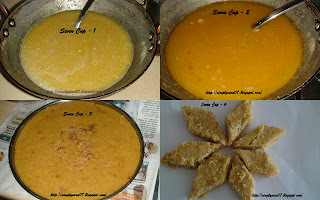 I have prepared with Paytham Paruppu also called Paasi Paruppu(Moong Dal). Wanted to do with toor dal which is usually done just for a change tried with this. Soak paytham paruppu for 1/2 hour in hot water and then cook in pressure cooker with enough water for 3-4 whistles or on stove with water. Keep it in medium flame as it will overflow and stir occasionally. Heat a Kadai, add 2 tspns oil add 1/2 quantity sliced onion and fry till brown.Take and keep it separately in plate. In the same pan/kadai add ghee and oil and mustard. Wait till its splutters. then add balance chopped onion,green chilli and pinch of salt. Fry for 2 minutes. Then add tomato and saute till its soft. now take cooked dal mash it well . Add cooked dal and stir well. Add salt and stir well. can add if water required. In a sauce pan put jeera and roast for 2 minutes and add to the gravy. Tadka - add little oil in sauce pan, add jeera and fry till onion till brown and garnish with chopped coriander leaves. Dal Fry is ready. This is a very good combination with Jeera rice which I made for weekend lunch today. Tips - While cooking any dal do not add salt, if you add salt dal will not cook. Always add salt finally. Dal should be watery semi liquid, once its cool it becomes thick. I wanted to send this sweet for Mithai Mela hosted by Srivalli but have been busy after vacation, so posting it now. This is one of the speciality of my Father-in-law. Am happy that finally learnt it from him. Seven cup is a easy and simple to make sweet. Its very tasty. Seven cup sweet is ready and can be served with lunch or any savoury. It should be consumed within 3-4 days and refridgerate. Am back after a short vacation for my son's 1st year Birthday with Manga Urugai (Mango Pickle) Recipe. Instant Manga Urugai (Mango Pickle) is very simple and tasty pickle. A very easy to prepare in 15mins. A good combination with curd rice. A meal is not complete without pickle in many occasions like marriages. Chop mango with skin into small pieces and put in a bottle. Put salt and red chilli powder and mix well. In a sauce pan add 1 tspn oil and fry venthayam till brown. Remove and grind to powder. Add 1 tspn oil , asafotida, mustard seeds and wait till it splutters. Add all these to the mango and mix well. Instant Manga Urugai (Mango Pickle) is ready to serve. Notes - Pickle can be stored upto 1 week in refridgerator.